The Fanshawe Falcons and Augustana Vikings opened day three with one of the most exciting matches of the championship. The teams exchanged the lead seven times over the course of the high scoring affair. With the game tied after eight ends, the Vikings tallied two in the ninth to go up 9-7. The Falcons were not deterred and responded by scoring three in the 10th, squeezing out an entertaining 10-9 victory. Lauren Massey led the Falcons at 75% while Katelyn Skolski curled an impressive 95% for Augustana. After starting the championship at 0-2, the Douglas Royals were looking to win their third straight game. The Holland Hurricanes didn’t make things easy as they carried a 4-3 lead over the Royals into sixth. Douglas scored three in the sixth end and one in the seventh to claim a 7-4 lead. Holland was gritty, getting one back in the eighth but Douglas puled away, getting three in the ninth to register a 10-5 win. 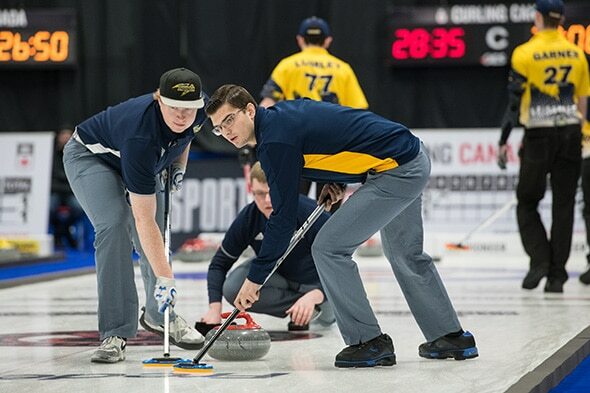 The Humber Hawks and NAIT Ooks exchanged singles throughout their match but the Hawks were able to bookend the game with multiple points in the first and last ends. Humber iced the victory with three in the ninth to win 8-4. The MacEwen Griffins built an early 6-0 lead against the Fleming Knights on route to an 8-1 victory. The Griffins’ Ashton Simard led the way at an incredible 97% and Andie Kurjata curled 83%. Teams were jockeying for position in the women’s sixth round with playoff positions still to be determined. Humber needed a win to stay in the hunt, but the Holland Hurricanes didn’t make it easy taking a 6-2 over the Hawks into the seventh. Humber battled their way back, getting one in the eighth, three in the ninth to pull even, and finally the game winning point the 10th. NAIT and Douglas were also striving to improve their positions and NAIT’s 8-4 win left both teams with a 3-3 record. The teams traded points for much of the match but the Ooks pulled away with two in the eighth and one in the ninth for the win. The Fanshawe Falcons and Fleming Knights were tied 6-6 in the seventh, but the Falcons scored two in the eighth and added three in the ninth on their way to an 11-6 victory. In a more conservative contest the MacEwen Griffins edged their ACAC rivals the Augustana Vikings 5-2 to wrap up day three. The NAIT Ooks were the lone undefeated team following the morning matches, but the Confederation Thunderhawks didn’t make it easy. The Ooks came out firing, scoring one in the first end, three in the second and two in the third for a commanding 6-0 lead. However, the Thunderhawks rallied back and scored one in each of the fourth, fifth, sixth and eighth ends to reduce the deficit. NAIT held on and capped their 7-4 win with one in the ninth behind 88% curling from John Ritchie. 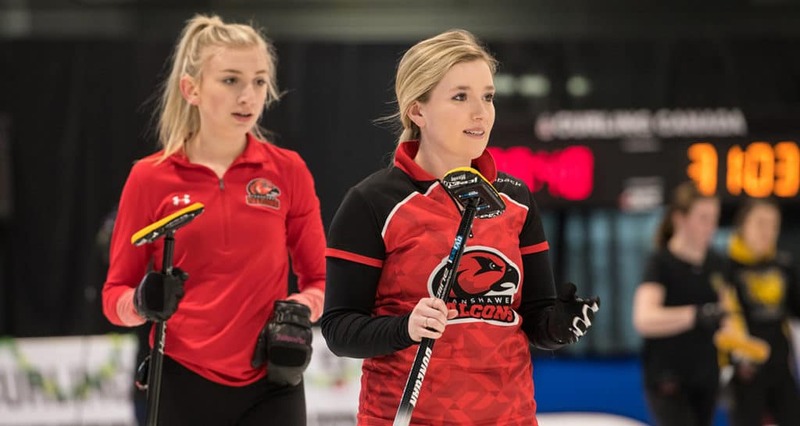 The Fanshawe Falcons controlled their match against the undefeated Concordia Thunder, holding a 5-2 lead after seven ends. The Thunder managed a late comeback though, scoring two in the eighth and one in the ninth to tie the game at 5-5. Fanshawe held the hammer in the 10th and closed things out with two to win 7-5 and hand Concordia their first loss. The Lakeland Rustlers and Sault Cougars traded points back and forth as they both battled to stay in playoff contention. Lakeland made their move late in the match scoring single points in the seventh, eighth and ninth to grab a 6-4 lead. The Cougars had a shot to tie it up with the last stone in the 10th but were only able to muster one and fell 6-5 to the Rustlers. The Humber Hawks came out flying, scoring four in the first, two in the third and three in the fourth for an early 9-0 lead on the Olds Broncos. Olds did not give in and narrowed the gap to 9-4 heading into the ninth, but the Hawks got two in the end to finish to defeat the Broncos 11-4. Sean Armstrong curled 78% for the Hawks and Tanner Sieben curled 81% for the Broncos. In the afternoon, cross-town rivals from Edmonton, the Concordia Thunder and NAIT Ooks squared off in a calculated contest that saw the Thunder hold a 4-3 lead aftr the seventh end. Concordia then put the match away with two in both the eighth and tenth for an 8-3 victory. Concordia curled 87% as a team with Tyler Van Amsterdam (98%), Cody Holowaychuk (89%) and Evan Van Amsterdam (88%) leading the way. NAIT also curled well as a team (79%) with contributions from Jonah Tobinski (86%), Trygg Jensen (83%) and John Ritchie (83%). In another back and forth affair, the Humber Hawks trailed the Sault Cougars 3-2 after three ends but recorded three in the fifth to take the lead 5-3. Sault tied things up in the sixth, but Humber moved ahead again with one in the seventh. The Cougars drew even in the eighth, but Humber closed the door for good with the last shot in the 10th to win 7-6. Behind an 88% effort from Dale Mizera, the Lakeland Rustlers scored five in the first in an eventual 13-3 victory over the Olds Broncos. The Fanshawe Falcons also scored often and early in their match with the Confederation Thunderhawks eventually winning the match 8-2. The Falcons had strong performances form Brady St. Louis (88%), Tyler Twining (83%) and Charlie Richard (81%) in the win. 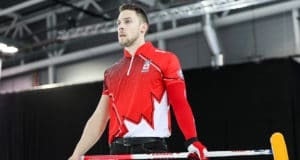 Sheet C will be televised throughout the 2019 CCAA Curling Canada National Championships, and will be available for viewing online at https://www.cbc.ca/sports/olympics/winter/curling/broadcast. 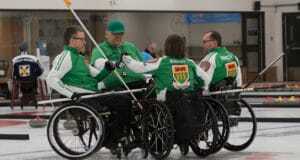 An under-25 mixed doubles test event for Atlantic Canadian curlers also wrapped up on Sunday at Willie O’Ree Place. Aleya Quilty and Alex Robichaud defeated Erica Cluff and Alex Peasley 11-8 in an extra end in the gold medal game.